2. This may take some time. *The data is processed on your own computer (the data is NOT transferred to our server). *The program searches number of bins from 2 to 200. 06/11/08 Ver. 0.10 Improved data sheet output. I. Divide the data range into bins of width . Count the number of events that enter the i'th bin. IV. Repeat i-iii while changing . Find that minimizes . *VERY IMPORTANT: Do NOT use a variance that uses N-1 to divide the sum of squared errors. Use the biased variance in the method. *To obtain a smooth cost function, it is recommended to use an average of cost functions calculated from multiple initial partitioning positions. An unknown underlying rate that generates observable events. Event sequences generated from the unknown rate. Histograms constructed from the events. It is not obvious which bin size should be used. Mean Integrated Squared Error (MISE), a measure of the goodness-of-the-fit of a histogram to the unknown rate. A histogram with the bin size that minimizes the MISE is optimal. Note that we can not directly compute the MISE since we do not know the underlying rate. However, the MISE can be estimated from the data. The optimal bin size can be estimated as the one that minimizes the estimated MISE. From the observed data only, the method estimates a binwidth that minimizes expected L2 loss between the histogram and an unknown underlying density function. An assumption made here is merely that samples are drawn from the density independently each other. The method was developed in collaboration with Prof. Shinomoto in Kyoto University. Go to Kernel Bandwidth Optimization page. What is an Optimal Bin Size? When you make a histogram, you need to choose a bin size. How large (or small) the bin size should be? If you choose too small bin size, a bar height at each bin suffers significant statistical fluctuation due to paucity of samples in each bin. If you choose too large bin size, a histogram can not represent shape of the underlying distribution because the resolution isn't good enough. There is an optimal bin size that remedies these two problems. The Java Applet below demonstrates the problem of the bin size selection. In the applet, data is shown in the upper box and its histogram in the bottom box. The data is an example from Neuroscience: a timing of neuronal firing (spikes) obtained by repeated trials. Twenty sequences (trials) are drawn in the data box. However, the data can be anything (weight, height, or test score etc. ), and can be one sequence. Click Here to start Java Applet. The histogram is shown in the bottom box by red color. The blue line is a distribution (or rate) from which samples are drawn as in the upper box. Our aim is to choose a histogram that best represents this blue line. As a first step, change the bin size of a histogram by using a scroll-bar at the bottom. With too small a bin size, you get a jagged histogram. With too large a bin size, you obtain a flat histogram. Now bring the scroll-bar left, and make the bin size thinnest. Push `redraw' button several times. The `redraw' button regenerates sample points based on the blue density distribution. Please confirm that the histogram shape drastically changes. If you are told to tell which of the two hills in the distribution is taller, can you tell? Although the right hill is taller than the left (blue line), the maximum height of a histogram appears at left side quite often. As a second step, bring your scroll-bar right most to make the bin size thickest, and push `redraw' several times. Confirm that the histogram shape does not change very much. In addition, you may be convinced that the right hill is higher than the left hill. However, can you tell where the highest point of the hill is? The resolution of the histogram is not good enough to tell. When you make a histogram, you need to choose a bin size that compromises conflict between sampling error and resolution. Now please check `error' check box on. Yellow area appears, which indicates an error between a histogram and an underlying distribution. You may turn off the `Histogram' check box. Examine which bin size produces the smallest total error by your eyes. You would find that the error becomes the smallest when you bring the scroll bar handle about one fourth of the total length from the left. Push `redraw' several times to check statistical fluctuation of errors. The optimal bin size of a histogram is the bin size that produces the smallest total errors (yellow area) on average of many realizations of sampled data (i.e. average over many pushes of `redraw' button). At this moment, you might say, "Okay, I understood what an optimal bin size is. But, how can we know it? After all, we do not know the blue underlying distribution. So we can not know the error. We can never know the optimal bin size from data." This statement is not true. Indeed, the error can be estimated from the data. The above method computes the estimated errors for several candidate bin sizes, and choose the bin size that produces the smallest `estimated' error. For the details of the method, please refer to Shimazaki and Shinomoto in Neural Computation. Q. It seems that the theory assumes a time histogram. Can I apply the proposed method of a histogram to estimate a probability (density) distribution? Q. I obtained a very small bin width, which is likely to be erroneous. Why? A. You probably searched bin widths smaller than the sampling resolution of your data. Please begin the search from the bin width as large as your sampling resolution. The minimum binwidth that the web-app searches is your data range divided by 200. If your sampling resolution is larger than it, ignore the suggested optimal bin. Please find the minimum in the cost function in `datasheet' for the bins larger than your sampling resolution. Q. Can I apply the method to the data composed of integer values? A. Yes. Please note that the resolution of your data is an integer. It is recommended to search only the bin widths which are a multiple of the resolution of your sampled data. Do not search the bin width smaller than the resolution. Q. I obtained a large bin-width even if relatively large number of samples ~1000 are used. A. If you made a program by yourself, please double check that the variance, v, in the formula was correctly computed. It is a biased variance of event counts of a histogram. Please do not use an unbiased variance which uses N-1 to divides the sum of squared errors. A built-in function for variance calculation in a software may returns unbiased variance as a default. Q. I want to make a 2-dimensional histogram. Can I use this method? A. Yes. The same formula can be used for optimizing 2d histogram. The 'bin size' of a 2d histogram is the area of a segmented square cell. The mean and the variance are simply computed from the event counts in all the bins of the 2-dimensional histogram. 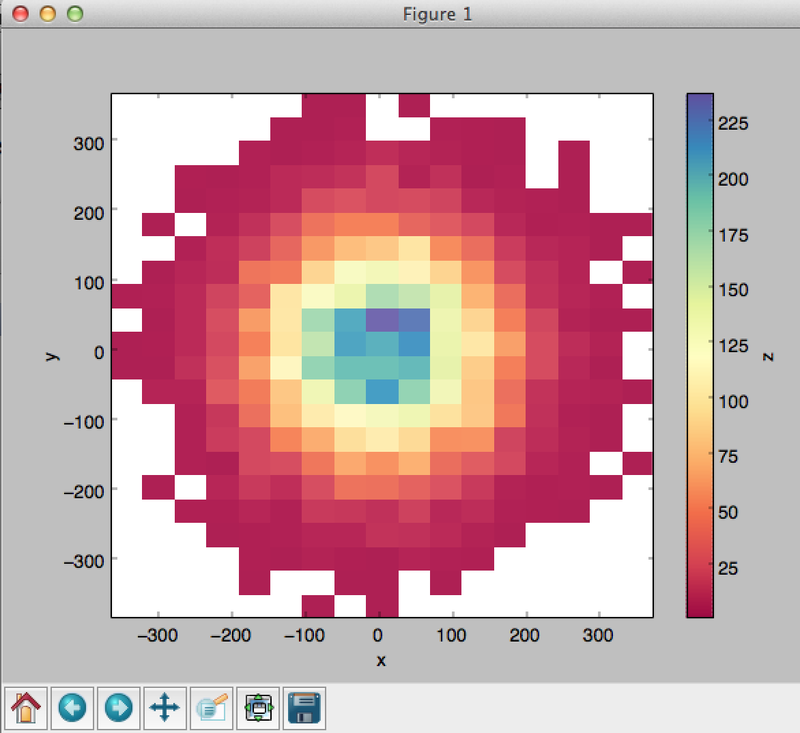 Matlab sample program for selecting bin size of 2-d histogram. and obtained bin size that differs from the result obtained by the present method. A. They should be different. Three assumptions were made to obtain the Scott's result. First, the Scott's result is asymptotically true (i.e. it is true for large sample size n). Second, the scaling exponent -1/3 is true if the density is a smooth function. Third, the coefficient 3.49 was obtained, assuming the Gauss density function as a reference. The present method does not require these assumptions. Q.What is the assumption in your method? A. The method only assumes that the data are sampled independently each other (an assumption of a Poisson point process). No assumption was made for the underlying density function (for example, unimodality, continuity, existence of derivatives, etc.). Q. Is it different from the least squares cross-validation method? A. Yes. The above formula was derived under a Poisson point process assumption [see original paper], not by the cross-validation. As a result, the formulas and chosen bandwidths by the two methods are not identical. Q. What is specific about the Poisson assumption? A. In classical density estimation, the sampling size is fixed. Under the Poisson assumption, the total data size is not fixed, but assumed to obey a Poisson distribution. The MISE is an average error measured by the histograms with 'many' realizations of the experiment. Hence, the histograms constructed from a Poisson point events have more variability than the histograms constructed from samples with a fixed amount. This leads to a choice of wider optimal bin size for a histogram under a Poisson point process assumption. The difference becomes negligible as we increase the data size. Q. You provide the method for optimizing kernel density estimate, too. Which of the methods, a histogram or kernel, do you recommend for density estimation? A. We generally recommend to use the kernel density estimate. Please check the kernel density optimization page, too. The FAQ includes my (HS) opinion. They are not opinions neither by my collaborators nor institutions I belong to. A bar-graph histogram is constructed simply by counting the number of events that belong to each bin of width . We divide the data range into intervals with each length given by . The number of events accumulated from all sequences in the th interval is counted as . The bar height at the th bin is given as . where refers to the expectation over different realization of point events, given . The first and second terms are respectively the stochastic fluctuation of the estimator around the expected mean rate , and the temporal fluctuation of around its mean over an interval of length , averaged over the segments. By replacing in Eq. (3.16) with the sample event counts, the method is converted into a user-friendly recipe summarized in the Method. YOUR CONTRIBUTION WELCOME! The codes include contribution by scientists from all over the world. If you could improve the code or translate the code to other languages, e.g., C/C++, please contact . It will be posted on this website with your name. Below is a simple sample program. % Please feel free to use/modify this program. % N_MIN must be more than 1 (N_MIN > 1). 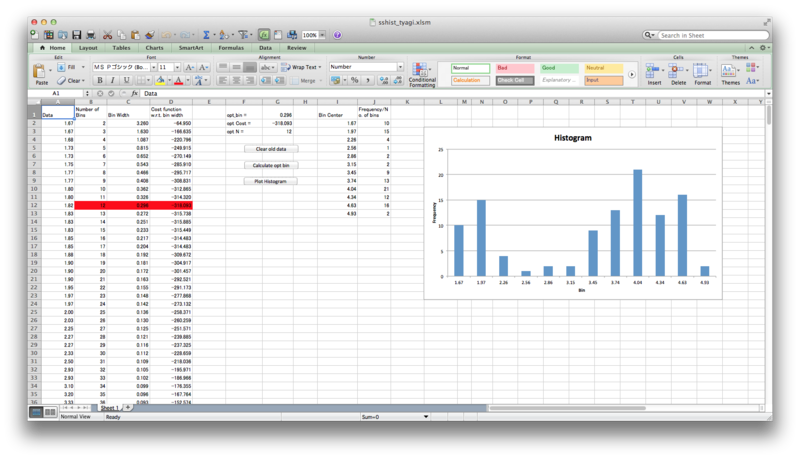 The following excel program that returns an optimal histogram is contributed by Anil Kumar Tyagi (ITER-India). Please feel free to use/modify this program. #N_MIN must be more than 1 (N_MIN > 1). The following IDL programs were contributed by Dr. Shigenobu Hirose at JAMSTEC. © 2006-11 Hideaki Shimazaki All rights reserved.